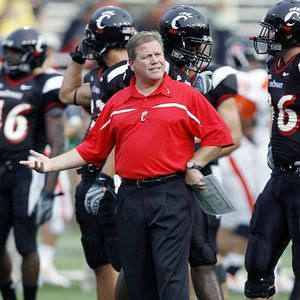 Bearcats Blog: Brian Kelly: Should he stay or should he go? Everyone and their brother knows that Brian Kelly looks to be on his way to South Bend. I can't imagine the Randy Edsall talk being anything more than a smoke screen or a negotiating ploy. As much as I love what BK has done for the university and want him to stay, I think that if he's going to take the Notre Dame job, he should leave immediately. There are a majority of people out there who think that he should stay and coach the Sugar Bowl, but I'm not one of them. They say that Kelly leaving immediately would be a sign of disrespect and a slap in the face to his players. Some people out there have already started calling Kelly a jerk, even though as of this post, he is the coach of the Cincinnati Bearcats. I can see their reasons why. Brian Kelly coached the team all season. Brian Kelly got them to an undefeated season, a Big East championship, and the Sugar Bowl. To leave them now, that would be betrayal. It would be stabbing the players who worked so hard for him all season in the back. If Kelly left, he would be showing no gratitude to the University for giving him the chance to coach in the Sugar Bowl, and the opportunity to be the coach at Notre Dame. To that, I say hog wash.
Brian Kelly should not waste another minute being the Cincinnati head coach if he accepts the offer from Notre Dame. As exciting as the prospect of playing in the Sugar Bowl is, it's a meaningless game. They aren't playing for the National Championship. If they destroy Florida, they won't be voted #1 by the AP and be a split champion if Texas beats Alabama. The AP didn't even vote them above TCU. They would only have a chance to move ahead of TCU if they dominated the Gators, and there isn't that great a chance of that happening. When Kelly left Central Michigan, he cut and ran before their bowl game to coach the Cats in their bowl win over Western Michigan. His assistants stayed at Central and coached the team in the bowl before coming to Cincinnati. That is a likely scenario if Kelly is to leave now. I can't see the university hiring a new coach before the end of the year, so one would assume that the assistants would take over. Jeff Quinn has been around long enough to handle things. Plus, it would give us all a great look to see if he would have what it took to become the new Cincinnati coach. Without getting into a coaching search post, I think that Quinn has to be one of the top candidates if Kelly were to leave. The school has never made a big splash hire, and Quinn would bring continuation to the situation. That is, unless he sucked and we could find this out first hand if he were in charge and the team played well in the Sugar Bowl. I hold this philosophy for all coaching changes. Just today, Louisville hired Charlie Strong, the defensive coordinator from Florida. Strong will split duties between Florida and Louisville until after the Sugar Bowl. I've written out Sugar Bowl so much that I'm starting to hate the game. It's going to be SB from now on. It probably should have been that way 5 minutes ago. Back to Strong. As a Louisville fan, I think he should dedicate this time to being the HEAD coach at Louisville instead of an ASSISTANT coach at UF. It takes time to put together a staff and start to rebuild the crumbling program. And his first month is going to be splitting duties. In one sense it doesn't matter because as long as comes off like he knows what he's doing like he did at the press conference today, Louisville fans are happy that Krag is gone. I think Strong should cut bait at UF and go to UofL even more than I think Kelly should potentially go to ND. To use this analogy, think of Kelly and UC as being boyfriend and girlfriend. If you were breaking up, would you rather her leave as soon as she came to the decision that she was going? Or would you rather her wait a month because it was your anniversary and you wanted one big, final celebration? When it comes to heart break, I want it quick. Thanks for the great work you did making UC football relevant for 3 years, now don't let the door hit you on the way out.